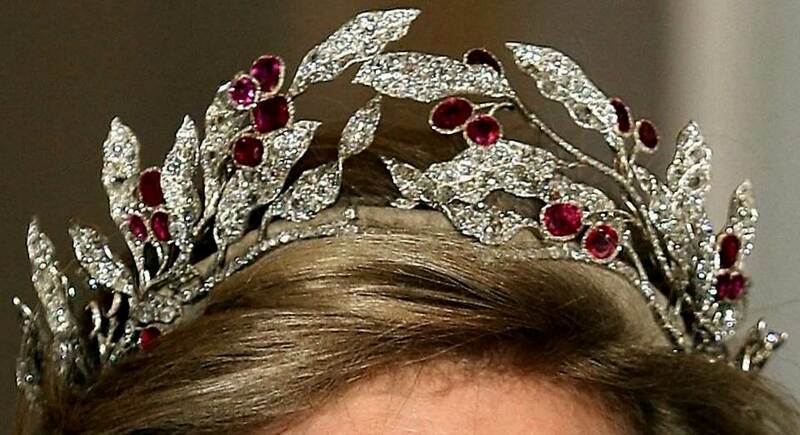 We’ve covered one of her trademark tiaras, the large topper for her grand emerald parure, but Queen Anne-Marie has another fantastic parure at her disposal as well: her rubies. Olga left the rubies to her son, Prince Nicholas, and they were worn by his daughter, Princess Olga of Yugoslavia. Olga’s sister Princess Marina, the Duchess of Kent, borrowed the rubies at least once. Eventually they came back to the main Greek royal family and were worn by Queen Frederika, consort of King Pavlos I. The rubies were among the jewels Frederika turned over to Princess Anne-Marie of Denmark when she married Frederika’s son King Constantine I, and the set has been worn by Anne-Marie ever since. These days, she prefers a shortened version of the necklace. Of the tiaras she now wears regularly – including the Greek Emerald Parure Tiara and the Khedive of Egypt Tiara – this is my favorite on Queen Anne-Marie. Rubies aren't my favorites (neither are wreath tiaras, to be honest), but there's something about the way this one nestles in her hairstyle that just works. Is this your favorite Anne-Marie tiara, or does your heart belong to another?